Labor Party chairwoman Shelly Yachimovich, who backed Prime Minister Benjamin Netanyahu throughout Operation Pillar of Defense, also expressed her support for the ceasefire with Hamas, which went into effect at 9 pm Wednesday. "Let's hope that the justified goals that were set before the operation have actually been achieved," she said. However, Yesh Atid head Yair Lapid and several other politicians leveled harsh criticism at the government's decision to agree to a ceasefire. "The truce comes at the worst possible time and before the goals set by the government itself had been achieved," he said. "After it was promised that Hamas would be eliminated and that we would not negotiate with it, the State of Israel negotiated with Hamas and failed to eliminate it," said Lapid. "The government displayed weakness and hesitance in the implementation of its goals after promising complete calm to the residents of Israel." Haim Ramon, who served as vice prime minister during Operation Cast Lead some four years ago, also criticized the ceasefire. "Unfortunately, it is obvious that this operation did not achieve its goals – when the main goal was to end the suffering of a million and a half citizens," he told Ynet. Opposition leader Shaul Mofaz blasted the decision to announce a ceasefire in Gaza, saying that "the operation's goals haven't been met. It's only a matter of time before the next round occurs. This is not how you end a battle against terrorism." Mofaz claimed that "the operation shouldn't have been stopped at this point. Hamas is empowered and deterrence hasn't been restored. 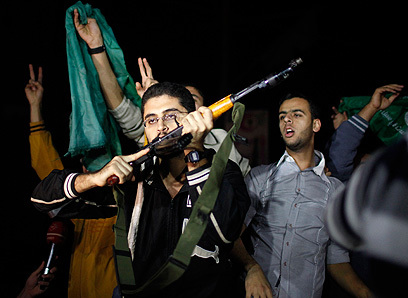 Hamas has the upper hand." National Union Chairman Uri Ariel said that the Israeli ceasefire announcement was "a lame display that unsuccessfully attempted to excuse the embarrassing capitulation of the Netanyahu-Lieberman government." The Knesset member said that "the residents of Israel feel betrayed, and they know that they will have to experience the government's hesitance on their own flesh." See all talkbacks "Mofaz: Deterrence not restored"